First make a frame using the Happy Frame die set. You need to cut the die out 4 times. Then trim the pieces to measure 6.25" and assemble the frame. Next cut a 6.25" square of white cardstock. 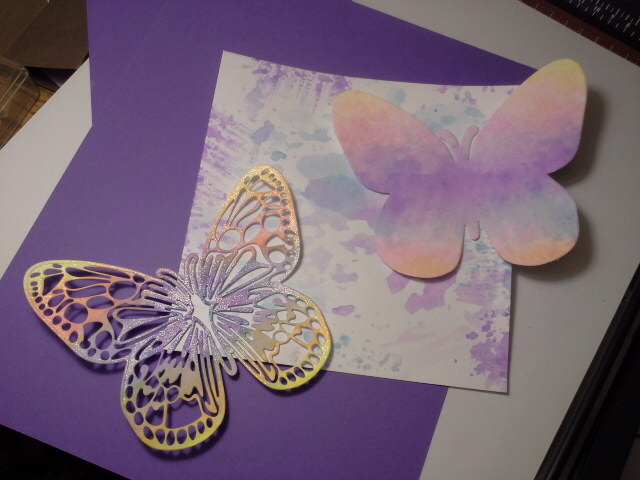 Using Tim Holtz Distress Inks, put down 3 complementary ink colors separated, on a non-stick surface like a craft mat. Spray lightly with water. Now take your white 6.25 square and pick up some of all the 3 sprayed ink colors randomly. Next cut out one solid butterfly pc. out of one of your inked squares and two overlay pcs. from two other deliberately inked squares. Note: This is a huge 5" die! When you glue the lacy aperture over it, this scoring step will make the butterfly 3D. Glue one of the apertures over the solid pc. Then glue the 2nd. aperture but only under the body. Now assemble the card. Add double side adhesive tape to all four edges of the background pc. Then adhere the frame on top. 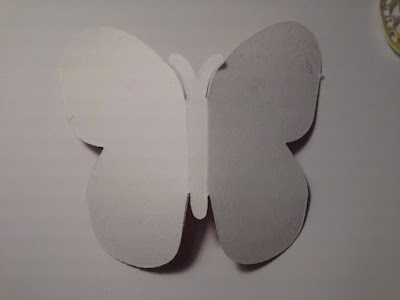 Add your Finished butterfly, but only glue down the body. Now, decorate the frame as you choose. I used these pcs. from these die sets to decorate the frame. I added some jewels to the butterfly and hanging hearts. WOW What a gorgeous creation Kathleen! I love the frame (now on my wishlist) and that butterfly is gorgeous!! Awesome inspiration ... thanks! Fabulous Shadow Box Frame and such a magnificent butterfly. WOW! Oh I love this card! 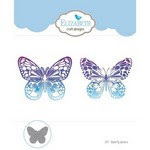 That butterfly is fabulous and love the choice of colors! Beautiful! So stunning, I love what you have done with those colors!!! This is stunning! 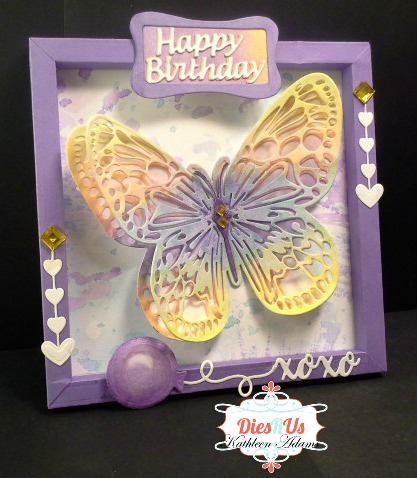 I love the beautifully colored butterfly and that frame is fabulous!